Bob Cunningham, bass; Alan Dawson, drums. Fearless Frank Foster may seem like an exaggerated title for some readers; somehow it smacks of comic strips and Saturday afternoon serials; it has echoes of the exaggeration found in the Madison Avenue build-up of everything from support stockings to stock market "supports"; in short, it sounds phony. 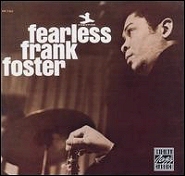 Frank Foster, fearless--there's little of exaggeration about that. In an age when you have to put your chin out every time that you want to present good music; when you must stick to your beliefs instead of compromising; yes, there's something fearless about that. Certainly Frank Foster has fears--he's human--that his music will not find the acceptance that his talent and ambition deserve. Every artist wants to be recognized, and with Frank there is a wife and his children to foster. All of this matters. There are fears. One tries . . .
Frank Foster has been trying to make good music since he left Cincinnati two decades ago to assume the peripatetic life of the jazzman. It has not been a bad life. There have been great rewards, notably an eleven-year sojourn in the Count Basie band, where Frank became the chief arranger in the best band the Count has had since his masterpiece of the late 1930s. Soon after leaving Basie, Frank was working with his quintet in Boston, Baltimore, Detroit, and New York. With regular employment the group began to jell, and with this record it begins to yell. "I think I'm stretching out more . . . And I'm giving myself a lot of room for solos so far. I guess that's why a lot of cats get their own bands, so they can do as much as they want to. But that doesn't mean that I want to hog all the solo space." In the six tracks on this record we find excellent examples of what Frank meant, for he has never before made an album which allowed him to extend his improvisational ideas so far, and all of his solos have the mark of maturity on them. It is not that Frank has come to the studio to practice (as so many egoists do on the bandstand in public), for in his maturity Frank's work allows for extension within the framework of art and without the rambling footfalls of anarchy. On this record under scrutiny we have some extremely satisfying moments from Frank and conferers which say "something." And from what I can hear of the interfusion of the five players is quite obvious that the leader knows what he and they are doing. What they are doing on "Raunchy Rita" is pricking another surface of the blues, keeping in the elemental groove of jazz with supplemental flights into the high-light zone. Meet Virgil Jones on trumpet--tasty. Al Dailey's piano solo rumbles attractively with a percussive quality I find memorable. And Frank's bit is unfettered. "Janie Huk" may have some particular reference to Frank, or it may be an anagram, but to me it is a swinging waltz. This is the longest track on the album and all the players have extended moments in the spotlight. One thing that stands out particularly is the fire that generates in the group as the theme progresses, until the five players reach a conclusion that is starkly effective. "Thingaroo" is a lighter piece, reminiscent of a chart for the Basie band, with a nice long line that allows Virgil Jones to punctuate the air with his best solo of the date. And Frank follows with another gem, in which he captures my attention particularly with the manner in which he reiterates his phrases. There is a fluency there comparable to a polished actor as he improvises with a poet's lines and makes them make more sense. Of such talent art is made. "Baby Ann" is an excursion toward Latin climates, and "Disapproachment" proves to be a challenge with its structure that is and is not the blues, but space does not allow me to comment on other than Fats Waller's "Jitterbug Waltz" from side B. Bravo to Frank for his selection of material, not only for allowing the variation of tempo, but for helping to carry on the music of the past into the present. The "Jitterbug Waltz" allows for something of the airy lightness that was the life of Fats Waller to enter into contemporary jazz, and the soloists seem to take Fats as their guide with an easy grace and flow in their solos. The "Jitterbug Waltz" is the only composition on this album which is not Frank Foster's. As leader, arranger, composer, soloist, Frank is well represented on this album. Any man with all that talent ought to be fearless. It seems that the album is well titled after all. --CHRISTOPHER PETERS, from the liner notes.